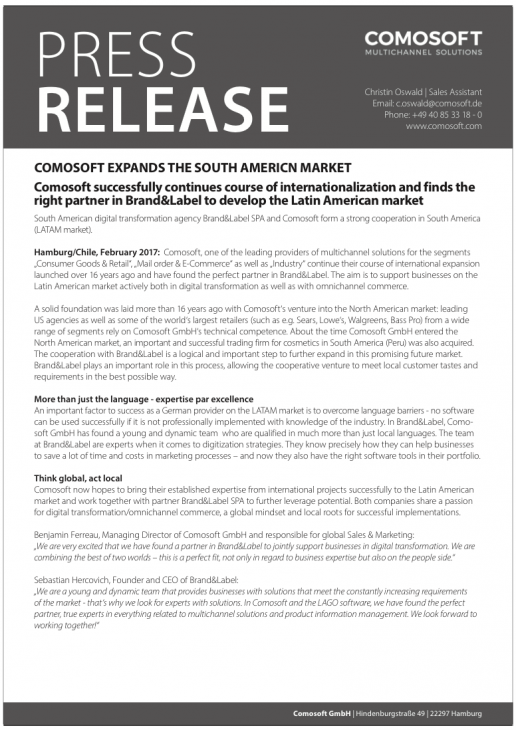 Comosoft successfully continues course of internationalization and finds the right partner in Brand&Label to develop the Latin American market. South American digital transformation experts company Brand&Label SPA and Comosoft form a strong cooperation in South America (LATAM market). Hamburg/Chile, February 2017: Comosoft, one of the leading providers of multichannel solutions for the segments „Consumer Goods & Retail“, „Mail order & E-Commerce“ as well as „Industry“ continue their course of international expansion launched over 16 years ago and have found the perfect partner in Brand&Label. The aim is to support businesses on the Latin American market actively both in digital transformation as well as with omnichannel commerce. A solid foundation was laid more than 16 years ago with Comosoft‘s venture into the North American market: leading US agencies as well as some of the world‘s largest retailers (such as e.g. Sears, Lowe‘s, Walgreens, Bass Pro) from a wide range of segments rely on Comosoft GmbH‘s technical competence. About the time Comosoft GmbH entered the North American market, an important and successful trading firm for cosmetics in South America (Peru) was also acquired. The cooperation with Brand&Label is a logical and important step to further expand in this promising future market. Brand&Label plays an important role in this process, allowing the cooperative venture to meet local customer tastes and requirements in the best possible way. An important factor to success as a German provider on the LATAM market is to overcome language barriers – no software can be used successfully if it is not professionally implemented with knowledge of the industry. In Brand&Label, Comosoft GmbH has found a young and dynamic team who are qualified in much more than just local languages. The team at Brand&Label are experts when it comes to digitization strategies. They know precisely how they can help businesses to save a lot of time and costs in marketing processes – and now they also have the right software tools in their portfolio. Comosoft now hopes to bring their established expertise from international projects successfully to the Latin American market and work together with partner Brand&Label SPA to further leverage potential. Both companies share a passion for digital transformation/omnichannel commerce, a global mindset and local roots for successful implementations.